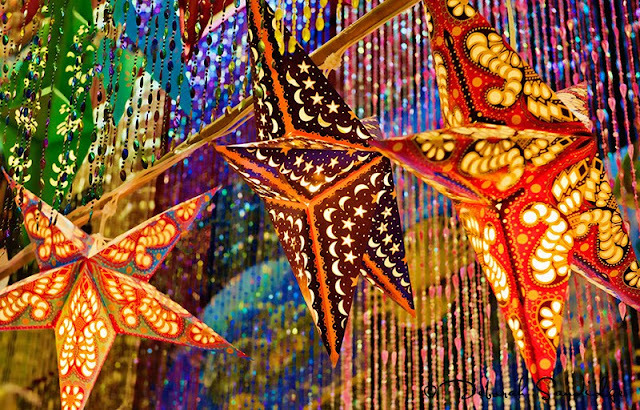 These paper star lanterns make a great window display. I like the layers of beads that fall behind the stars, creating a colorful background. This was a Hail Mary type grab shot inside the store, using a wide aperture and fast shutter speed, handheld at ISO 1000. Tripods can get in the way in tight spaces! When I was little, I use to have a tiny oriental lantern with red tassels, my favorite color! I thought I had arrived. I should have bought one of these stars to hang in my studio, next trip! Somehow the colors make everything festive and fun. Maybe a room full of stars and crescent moons... Have fun shooting!